2929 Edison Avenue--Zoned CCG-2 5,184+ Sq. Ft. warehouse with detached storage building. 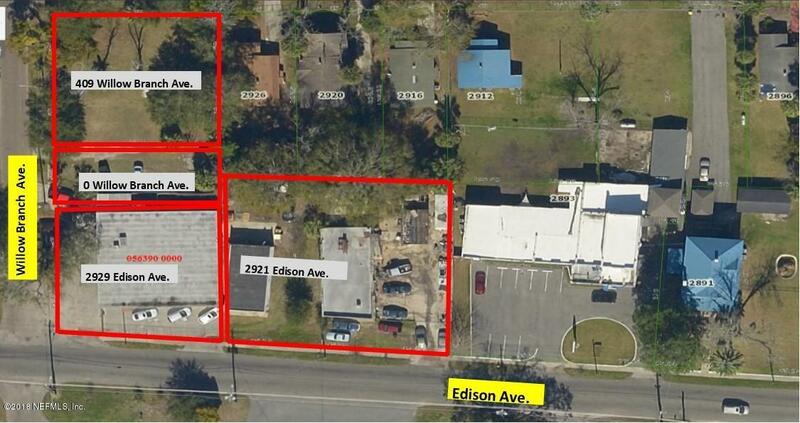 Includes attached, fenced vacant 50'x100' lot. (0 Willow Branch Avenue--Zoned RLD-6) for parking and storage. Warehouse includes offices and conference room, kitchen and two bathrooms. Roll-up door for truck loading/unloading.2925 Edison Avenue--Zoned CCG-2 Small warehouse--25'x50'2921 Edison Avenue--Zoned CCG-22,925 Sq. Ft. shop/warehouse building. Currently tenant occupied at $700 per month on month-to-month lease. Additional storage building, block construction approximately 800 Sq. Ft.+/-. 409 Willow Branch Avenue--Zoned RLD-6100'x100' fenced vacant lot used for surface storage and parking.Fully fenced and secured Zoned CCG-2 and RLD-6 Easy access to I-10 Excellent owner/user site with room to grow Value add opportunity for increased rents on 2921 Edison Ave.